Trimatostroma salinum, Wallemia ichthyophaga, Hortaea werneckii and Phaeotheca triangularis are halophilic fungi, which can thrive in a wide range of salinity. They present a source of valuable bioactive compounds, enzymes and proteins interesting for food and pharmaceutical industry. 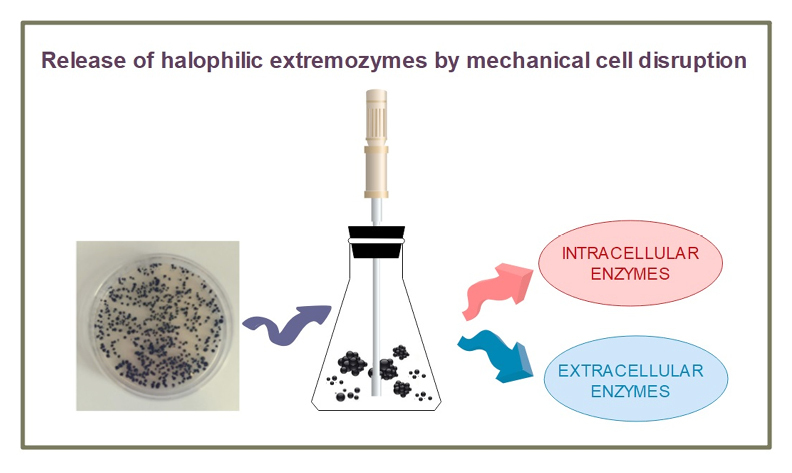 To separate enzymes from halophilic fungi cells, the mechanical method was used. Obtained results and new findings are important from the biotechnological point of view, since the separation of in the form of cocktail from halophilic fungi is interesting for industrial applications, especially for cascade reactions. Enzymes from extremophiles namely possess improved properties and can be used at harsh conditions where non-extremophilic enzymes may deactivate. Activity; enzymes; halophilic fungi; mechanical method; proteins.